Super speed. Size manipulation. Telepathy. These are all hallmarks of some of the greatest members of the Justice League. So it should come as no surprise to learn that Santa Claus is a card carrying member of the JLA, right? Well, that's the case in this holiday themed issue of Mark Waid's JLA run. While spending Christmas Eve with Woozy Winks and his family, Plastic Man is tasked with getting Woozy's nephew to bed in time for Santa to make his visit. 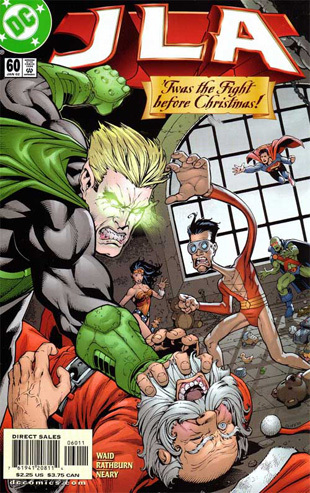 Plastic Man recounts the Justice League's first meeting with Father Christmas, who had been captured by Neron. When even the combined might of the JLA fails to stop Neron's plans, it falls to PÃ¨re NoÃ«l to "open himself up a can of whoop-elf" and save the day.